KFC??? No, I haven't run out of restaurants to blog about. Trust me, there are plenty left. I'm pretty sure everyone has tried KFC. Well, almost everyone except for vegetarians, vegans, health enthusiasts and people with good taste. Oh okay, I know that last one is pretty harsh. 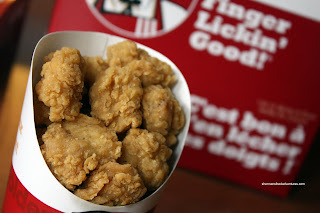 As much as I'm not a huge fan of KFC, I can eat it sometimes. Like once every 365 days or I'm in a small town somewhere with no other choice. 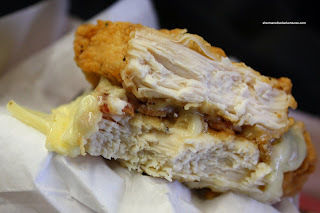 The main reason for his post is that I have mentioned KFC many times when discussing other fried chicken joints such as Church's, Lee's, LA Chicken, Popeye's and Ezell's. So why not have a baseline to refer to? Furthermore, this is a perfect venue to talk about the Double Down which was introduced officially today on October 18th in Canada. Yes, it's been available in States for some time; but finally I got to give my arteries a run for their money (but more on that later). A few months ago, I braved the rain and risked my health for the purposes of research. Also, it happened to be Thursday, where the deal is 10 pieces of chicken and a box of fries for $12.00. 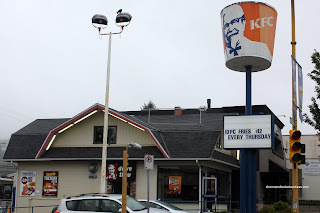 I rarely visit KFC so I didn't even know when it actually opens for lunch. Thus, there I was standing in the rain waiting for KFC to open at noon. I don't like waiting for anything, let alone this. While waiting for the store to open (and it was late by the way! ), I remembered back to my last visit to this location. I had to think hard since it was over 2 years ago! That particular visit left a bad taste in my mouth, literally! I had ordered gravy to go with the fries and believe it or not, the darn thing was uncooked! Imagine raw flour, bouillon and water. Disgusting. Quality control? Nope. So after a brief wait, we were let in and I got the aforementioned special. I went for half Spicy Crispy and half Original Recipe. I tacked on a small order of Popcorn Chicken for the kiddies. Maybe because I was first there, the chicken turn out to be more moist than usual. 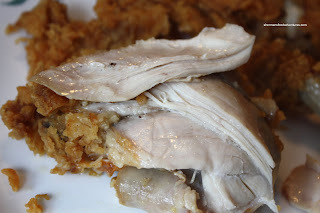 I find KFC chicken to be quite dry. However, the spicy crispy is more juicy due to the thicker batter. I actually like this version more than the original. There is more flavour in the meat itself. With the original, the meat is rather bland and dry. The skin provides most of the flavour. 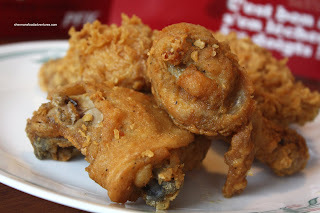 I don't hate KFC chicken; but I personally like Lee's more. It's crispier and more moist. A direct result of being freshly fried; rather than being kept in a warmer. For me, the pieces at KFC seem a bit small, especially the drumsticks. 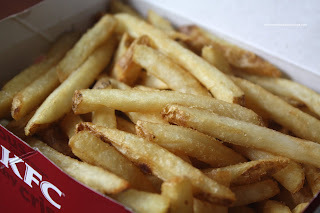 As for the Fries, they are indeed starchier and drier than most. I must admit I like dipping it into the gravy (when not raw). The kiddies love the Popcorn Chicken. For me, it's okay, if you like eating batter. There amount of chicken is overwhelmed by the coating. They should call it popcorn flour. Meh. KFC is fine if there are no other options available. 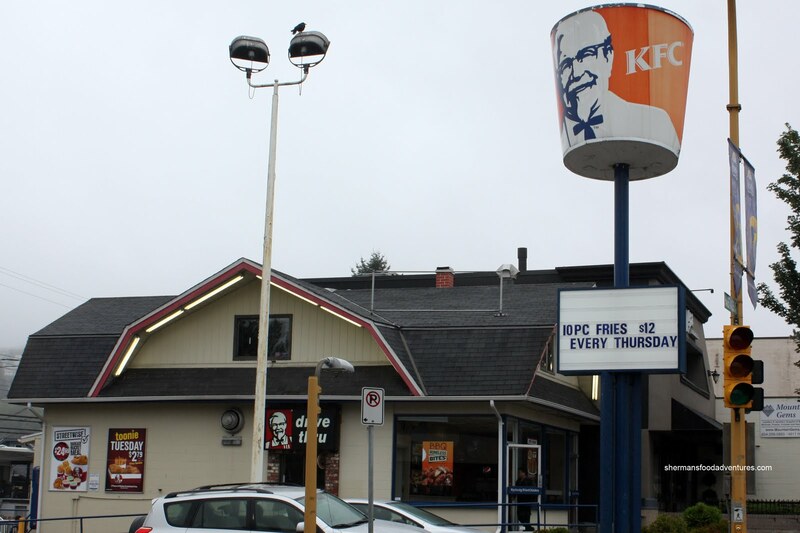 When paying regular prices, I find that KFC is actually quite expensive. Thus, this experience is like every other time - underwhel ming. Best to stick with Lee's or LA Chicken. Fresher, more moist and cheaper. Now with all that being said, I returned today (yes today, as of the posting date) for the official debut of the Double Down in Canada. 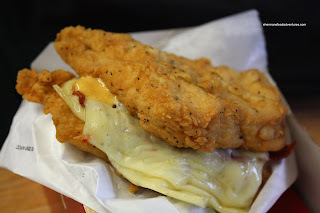 The people that matter at KFC had the audacity to create a sandwich that replaced the bun with 2 fried chicken breasts. 2 slices of pepperjack cheese and bacon are nestled in between. Healthy? Nope. But surprisingly, there are things that are much worse. Read this and you'll see that the Double Down is better for you (all relative) than many other fast food monstrosities. With that being said, I found the sandwich very salty. The combination of the 11 herbs and spices, cheese, Colonel Sauce (uh... okay) and bacon made me chug all the water that was available. I originally promised Viv I'd only take a bite. I ended up eating the whole darn thing. I gotta admit, as salty as it is, I didn't mind it. Now on the other hand, I'd probably not eat another. It's the been there, done that phenomenon. I must give them kudos for trying something like this. It is so wrong on many levels; but somehow people want to eat it.